Immaculately kept home in Cooper Creek on 0.72 acre with additional outbuildings including a 30ftx30ft shop and detached guest cabin. Spacious 2 bedroom 2 bath home with open plan living. Large master with 4 pce ensuite and walk-in closet. Open plan living room, kitchen and dining with propane fireplace. Plenty of living space and move in ready. GST applicable sale. Rural retreat in the historic townsite of Poplar Creek. 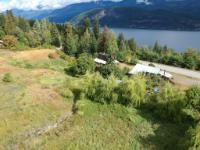 0.83 acre lot with very easy access from the highway. Has been cleared and ready for parking the RV for the summer and exploring or building a summer cabin. Selkirk Mountain Range, Trout Lake and Kootenay Lake all within easy access. Quite the gem in the heart of mountain country. Affordable two bedroom ground level condo in Nelson. This unit has seen many improvements in the past handful of years including new laminate and carpet flooring, new kitchen with new cabinetry, new bathroom, and sliding glass doors. Enjoy the seasonal lake view from the private patio. Convenient location close to schools, hospital and downtown core. Quick Possession available.